VenFest is the new name for the Dorset Food and Venison Festival which arose from the Lottery funded Beacon Project, a three year community development programme in Lytchett Minster and Upton. 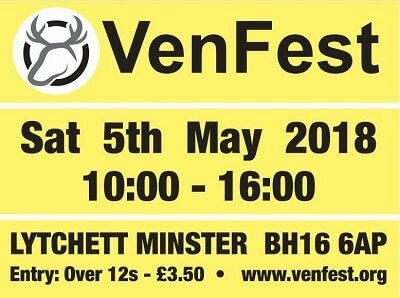 VenFest is on Saturday 5th May 2018 from 10:00 – 16:00 and the admission is £3.50 for over 12s. The festival was created to highlight the ongoing management/reduction of the density of sika deer, whose unnaturally high populations in Purbeck are known to damage the salt marsh, mire and woodland habitats (NE SSSI condition assessments) as well as being detrimental to farming interests has created enough ‘grazing headroom’ to finally contemplate a significant increase in extensive stock grazing’. So it’s local, it raises questions about ecology, healthy eating (venison is very low in fat) and it tastes good! Since ‘management’ implies venison production, we settled on ‘venison’ as our main (not exclusive) theme. So it’s local, it raises questions about ecology, healthy eating (venison is very low in fat) and it tastes good! It is not all about venison but it is very much the theme. Last years footfall was around 2,500. They are hoping for 3,000 this year. They are selling numbered Programmes for 30p, which are also used as a raffle ticket for the main draw. They are also selling advertising space within the programme to anyone who wants to purchase some.